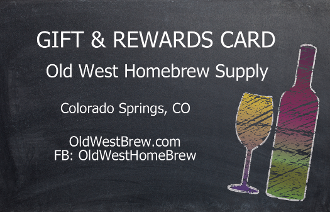 1) Visit our website at http://www.oldwestbrew.com, and put your order together using our shopping cart. The cart will show you shipping charges and any taxes that may be applicable, so you will know the exact amount that will be due. When you are ready to check out enter your Credit Card Information if the order is for more than your gift card and under the 'Special Instructions" field type in the gift card number from the back of your card. We will debit the amount from your gift card and charge anything additonal to your credit card. If your order is fully covered by the gift card or if you will still have a credit balance left check off 'Pay In Store" as a payment method, then enter your gift card account number under the "Special Instructions" field and we will take it from there. 2) Call our toll free number and let us know what you would like. We can help you put your order together over the phone and give you and amount due or let you know what you have left to spend on future orders. Have your Gift Card ready, as we will need the card number located on the reverse side of the card.